You came to dry land, O monstrous strange thing! 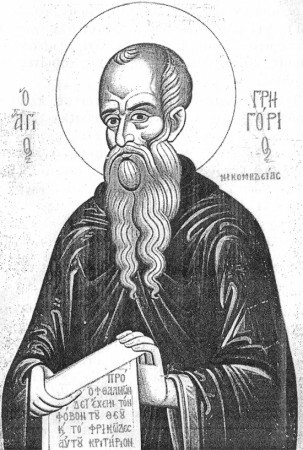 Our Venerable Father Gregory was born in 1190 and was from Nicomedia. From a young age Gregory lived according to the commandments of the Gospel. In his studies he was brilliant and diligent. After some time Gregory retired to one of the famous monasteries of his time in Bithynia. There he shined with the virtues. Some corrupt monks however falsely accused him of stealing certain church vessels from the monastery. Though his innocence was proved, Gregory left the monastery and went to another monastery where his brother lived. There Gregory further developed his knowledge and his virtue, and for this he was ordained a priest. At one point he ascended a mountain named after the Prophet Elias, where he built a cell and dedicated himself to hesychasm and study and guiding the faithful who came to him seeking his advice and blessing. Many benefited by his prophetic grace. On the 2nd of April in 1240, at the age of fifty, Gregory reposed in peace. It appears according to various accounts of pilgrims that his incorrupt relic was kept at the Peribleptos Monastery of Constantinople, though we do not know when it was transferred there. The transfer must have taken place after the recapturing of Constantinople from the Latins.